Sree Rama and Hanuman are two major mythological characters depicted in the epic Ramayana. Lord Sree Rama is the seventh avatar of Lord Vishnu. Lord Hanuman is portrayed as an ardent devotee of Lord Rama. Lord Hanuman is usually shown with Lord Rama or Goddess Sita in temples. Here Lord Hanuman stands on the left side of Lord Rama. 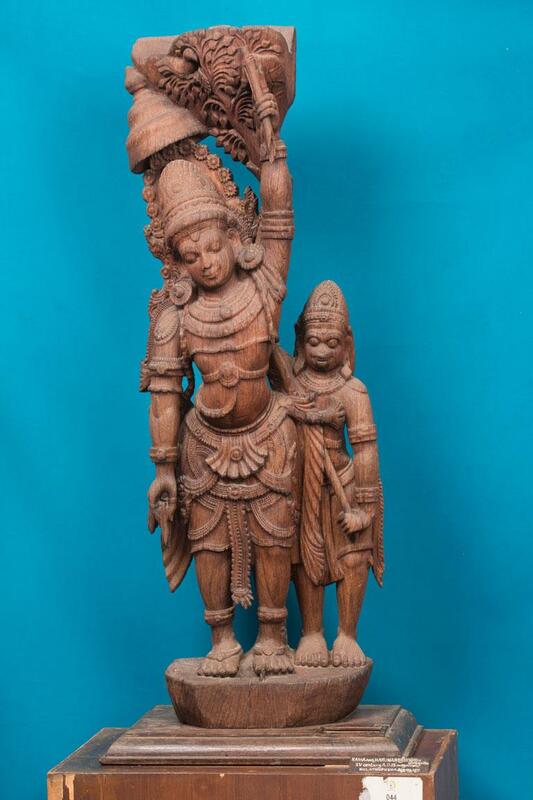 The left hand of Lord Rama is pictured as raised upwards. Both Lord Rama and Hanuman are well dressed and are also decked with ornaments. The two are standing on a wooden pedestal.